Hi, folks! Remember my little daydream I was writing that was "to be continued"? Someone left a comment on the previous installment saying, "Don't forget, I'll be at that auction, too." I told her I'd write her in, and maybe I can be generous and give her a bit of success...but it is my daydream, so I shall triumph in the end. The auctioneer says, "A dollar? A dollar? Well, all right, Jay, but don't you think that's a trifle low? Let's see what else is in this box." He practically winks at the crowd as he forages around in the box. The cutting board is lifted off the top and you see a painted doll head with side curls. I am sunk. I expect him to carefully lift the doll up, but he moves her aside and pulls out something wrapped in a towel. He unwraps the towel, lays it aside and cups a pottery jardiniere with a scene painted on it in both hands. He holds it as if it is his newborn grandson. I swear if he'd had gold fillings they'd be glinting in the bright April sun. Brainwaves are computing and colliding all around in the spring air as the auction attendees decide how high they should bid, but not one facial muscle twitches on any of them. The silent computing is interrupted by the auctioneer crowing, "What we have here, folks, is a Weller jardiniere from around 1900, with a dutch girl walking a path in the foreground and a house and windmills in the back. It does have crazing and some slight stains from use over the years, but has no chips, cracks or repairs. It's all good, folks. the original deal. It has a mark of SA before the usual Weller mark. I've never seen that before. I tell you what I'm gonna do. To make this more interesting, let's auction this thing off by itself...sooooo....is anyone feeling a bit more generous?" A quiet, tall man lifts his hand and says, "I'll give you $10." And off it went...if you've ever been to an auction, and most of you have, I'm sure you know the patter. The jardiniere ends at $695 with the tall man giving the final bid. I was breathing a sigh of relief, thinking I could bid freely on the egg beater, cutting board and doll. "Okay, folks, now we're ready for the scrambled eggs box lot. We have a cutting board, egg beaters, an old fallin' apart tied quilt and an old doll. The doll has some primitive appeal, but I couldn't find any marks on her. The quilt would be good for using the back cloth for something. Who'll give me $10 for this lot to start off with?" "I bid $50!" a pretty blond woman with an accent calls out. Darn it! Where did she come from? "75", I say in my best impassive Mainer voice, sounding a bit bored as I scuff the mud with my foot. "$100!" says the blond one. "I have a hundred, do I hear $125?" Tall man lifts a finger. "$125, do I hear $150?" Blond woman raises her hand emphatically, "$300!" Darn it all, darn it all, darn it all! "Hmmm," the auctioneer says. 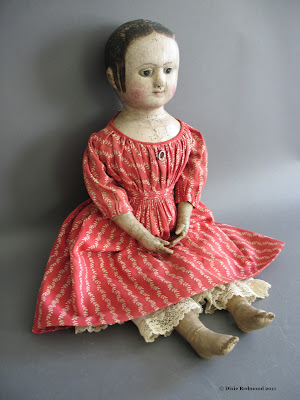 "Maybe I missed something with this doll..." He begins turning her over in his hands, "... the dress is made like it might be from around the 1850's, and she does have some sweet little painted boots with painted on laces, and the hands are interesting, but the paint is cracking a bit. The head is painted, but those are some ugly ears." He looks up, "Kind of like Harry's over there!" The crowd laughs and Harry laughs, too, but his ears turn a bit red. Harry must be the regular mascot at these auctions. "Okay, the last bid was $300...do I hear $400?" Up my hand goes to make my $400 bid. My husband did say to have fun. If I win this doll, and if it is a real Izannah doll, then I am not going too high, I know. At this price, it's a gift. "I have $400, do I hear $500?" "Do you take a credit card?" the Swedish (Danish, German?) woman calls out. "Yes, ma'am! We love those credit cards." "Then I bid one thousand dollars." Noooooooooooooooooooooooooooooooo! Oh, no she didn't! "I have a thousand dollars, do I hear $1200? Going once, going twice..."
"1500!" I call out, forgetting my impassive Mainer persona. My husband did say to have fun. But I know that's a lot of money to spend on a doll. I don't know if I can justify it when Old Bessie has $93,000 on her and needs replacing. "I have two thousand dollars, do I hear $2100? Two thousand going once, two thousand going twice....SOLD to the nice lady with the blond hair!" He pats his belly and actually snaps his suspenders. Yes, really. "This is why I like being an auctioneer, folks," he tells the crowd as if he is giving them a gospel truth. "I can't know everything, but through the bidding I learn, y'see? I'm really just a student of old stuff. Now if I ever see another of these here dolls, I'll know they're worth something. Ma'am...I sure am glad you came. Where are you from?" The pretty blond woman smiles, "Denmark." "And what are you doing in the states?" "I'm visiting all the museums with Izannah Walker dolls in them. That is an Izannah Walker doll." "Well, I sure am glad you came. How did you happen to come to this auction?" "I was staying at a Bed and Breakfast on the coast and wanted to come to a Maine auction. I saw your ad in the paper. I am so glad I came." Enough all ready, pretty lady. "And I am glad, too, ma'am." He turns to the next box lot. "Well, I have a flight to catch in Bangor so I need to go - where do I pay?" Ms. Denmark asks. "You can pay Sally at the table on the porch, ma'am. Have a nice flight home." OH MY GOD - I forgot my purse at the hotel or is it maybe stolen ? I can´t pay for it !!!! Dixie this is so fun! 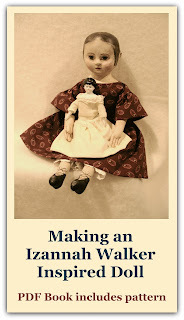 I keep telling my husband that one of these days I may just find a very valuable Izannah Walker doll at a garage or estate sale. He's so much better about pulling the car over now when we happen upon a sign for one!!!! Little does he know, I have no intention of selling her if I do!!! LOL. You are a fabulous writer, I'm sitting on the edge of my chair. MORE MORE!!!! I did Lana - now I have no money, passport etc. maybe the nice lady from Maine will help me ?? ?